It’s Thursday and that means the eShop is ready for a new round of releases to tempt us. This week sees Horizon Chase Turbo race onto the Switch, along with the survival instincts of This War of Mine, plus tug-of-war madness with Nidhogg 2. Don’t forget the massive Cyber Sale that’s on right now. There’s plenty on offer for all types of gamers, so check out the full list below and let us know which games will end up on your playlist this week. 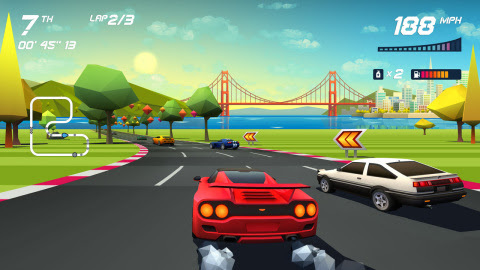 Horizon Chase Turbo – Horizon Chase Turbo is a racing game inspired by the great hits of the ’80s and ’90s. Race your way through opponents and master the circuits as you relive the classic arcade gameplay. Horizon Chase Turbo has a retro soul in a modern body. You’ll drive your car through extraordinary places, watching the sunset and facing rain, snow, harsh sandstorms and even a volcanic eruption. Horizon Chase Turbo will be available on Nov. 28. This War of Mine: Complete Edition – In this game, you do not play as an elite soldier – rather, you are a group of civilians trying to survive in a besieged city, struggling with lack of food, medicine and constant danger from snipers and hostile scavengers. The game provides an experience of war seen from an entirely new angle. Make life-and-death decisions driven by your conscience. Try to protect everybody from your shelter or sacrifice some of them for longer-term survival. During war, there are no good or bad decisions. There is only survival. This War of Mine: Complete Edition will be available on Nov. 27. Nidhogg 2 – The next installment of the epic, award-winning, dueling tug-of-war is here! Stab, shoot, slice or stomp your opponent to gain control of the screen, then book it to your side of the arena. Before long, a new opponent will appear. If they kill you, they get control. Get all the way to your end of the arena to win … and be devoured by the Nidhogg. Nintendo eShop Cyber Deals: Nintendo is making it easy to save this season with big savings – up to 50% off on select digital games for your Nintendo Switch or Nintendo 3DS system! Fans can purchase on Nintendo.com or directly from Nintendo eShop to purchase and download games to play over winter break or right away. My Nintendo members also earn Gold Points* on qualifying digital purchases, so it’s a win-win. This sale runs through 8:59 a.m. PT on Nov. 28. Other great deals this week! Check out the full list of deals available this week. Pokémon: Let’s Go, Wallpaper! – My Nintendo members: Redeem your points to get a new wallpaper for your smartphone and PC featuring the stars of the Pokémon: Let’s Go, Pikachu! and Pokémon: Let’s Go, Eevee! games.